Why should I be so mad at Marxist philosophy? This question articulates, with much apropos, a mental state after working through the nearly five hundred pages of information overload – surplus, one might say – which is Gregory Claeys’ Marx and Marxism. I am referring to the overabundance of information concerning Marx’s biography and the history of Marx’s thinking, as well as the plethora of very insightful historical facts concerning Marxism(s) – as in Leninism, Maoism and Co. – in this bipartite weighty tome. Surplus, in this case, is not only a vice, but also a virtue: much is to be learned about the overarching history of Marxism and the book regularly provides amusement and enlightenment with many interesting anecdotes. Reading the book within a relatively short period of time also reveals, in a way that no other book on the same topic had done before, how dense and short-lived the history of (practiced) Marxism has actually been, and how marginal the remnants actually are. That being said, the book is not on an introductory level. Someone who expects an easily digestible introduction to Marxist ideas and its history will either be disappointed or battered to death by the sheer scope of this Marxian cornucopia. Given the abundance of arguments and facts, there is no chance in this short review to do justice to every aspect of Marx and Marxism. As the second part is chiefly concerned with an historical analysis of Social Democracy, Leninism and the Russian Revolution, Trotsky’s and Bukharin’s legacy, Stalinism and the Gulag, Western European Marxism (bizarrely including the Frankfurt School, Existentialists and “Post-Moderns”), Maoism, Ho Chi Min and Castro, it is philosophically not as interesting as the first part of the book where, albeit insufficiently, the Hegelian origin of Marx’s thinking and philosophical coming-of-age is thematised. The following critical review will as such focus on the first part of Marx and Marxism. To begin with, given how Claeys intermingles history and theory, it is sometimes difficult, while reading, to distinguish the author’s voice from the many historical and contemporary voices he is, if not quoting, then paraphrasing. Criticising Claeys directly and on a point-by-point basis is thus a rather audacious undertaking. Instead, let us restrict the discussion of Claeys’ work to a general, yet central impression: Marx and Marxism is written with a firm anti-philosophical mind-set and an implicit preference for phantasm-soaked utopia, a la Fourier, over any philosophical, that is, primarily Hegelian, thought. Let us make this impression more precise. The core of Marxist theory, as Claeys paints it, lies in the conviction that the idea that Marx was first and foremost always a philosopher is misleading, if not simply mistaken. For him, it is the “Mature Marx” (chapter 9) – the Marx of the Grundbegriffe and Das Kapital, that is, the Marx who allegedly replaced Hegel with Saint-Simon and Blanqui in his thinking – that is far superior to the young Hegelian Marx and also the only Marx worthy of closer consideration. 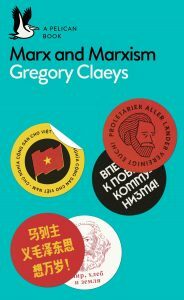 Claeys’ preferred method of analysis, reading Marx and his philosophy through the history of socialism and communism, approves the implicit definition of Marx as first and foremost an historian and political theorist, rather than a philosopher. This methodology, so Claeys argues, ‘lets Marx appear more practical and less wedded in metaphysical schemas’ (7). The first chapters of Marx and Marxism therefore appear dismissive at points and lack the necessary depth for a nuanced and sophisticated dialog with Marx’s contributions to the idea of social emancipation. The anti-philosophical position manifests itself right from the beginning. In chapter one Claeys discusses the political and philosophical Zeitgeist of Marx’s student years but sweeps over Hegel’s dialectic with an astonishing pace. Much emphasis is put on the ideas of the Young Hegelians, but again, even here looking into the metaphysics is systematically avoided. As a consequence, a comprehensive understanding of Marx’s philosophical apparatus is rendered inaccessible. Even the most intelligent reader completely unfamiliar with Hegel and Marx may feel hopelessly bewildered. A reader interested in the philosophical aspects of Marxism should therefore consult different sources before reading Marx and Marxism. The reason for the avoidance strategy, says Claeys, is the ‘tortuously obscure, convoluted Hegelian phraseology, which renders Marxism a kind of gnostic, secret science’ (6). This claim is in many ways preposterous: understanding Marx without the Hegelian background seems even more of a stretch than trying to understand the oh so convoluted terminology. The claim also conveys an attitude of ignorance: the language-game of philosophy is as complex and prima facie obscure as Claeys takes it to be, for a reason. Whole traditions of philosophy have focused on analysing language and the meaning of words. Sometimes unsatisfied by the conventional meaning of words philosophers have altered conventional language to better translate their thoughts into a medium. So, working to understand a philosopher is in many ways, and often primarily, working to understand the philosopher’s language. It is only a gnostic, secret science as long as there is no effort made to understand the philosopher’s language. Since many philosophical theories are of no interest to the wider population, the phraseology is only problematic if the philosophical theory is anticipated to have a broad reception (which is rarely the case). In the case at hand, as the “Mature Marx” demonstrates, the phraseology can easily be translated into the mundane, materialistic language of Grundrisse and Das Kapital. Feuerbach and Hegel were abandoned by the 1850s, replacing alienation with wage labour, (abstract) humanism qua Gattungswesen with (concrete) historically grounded co-operative activity, ultimately, replacing (lofty) metaphysics with (down to earth) economics. But this doesn’t mean that Marx stopped doing philosophy. In fact, even the break with Hegelian philosophy in 1845 has a philosophical, even Hegelian, motivation which Claeys ignores: being deeply grounded in Hegelian dialectics, communism, Marx held, is the antithesis to capitalism. Philosophy moves forward through the sublation (Hegelian language for the “overcoming” or “superseding”) of contradictions. Marx conceded that through a manifestation of this philosophy in the actions of the proletariat, the world (history) moves forward. As such, Marx became a communist through his deep inclinations with Hegel. How, then, can the role of philosophy be downplayed or even pilloried? Claeys provides even more reason to disregard Marx’s philosophical ambitions. ‘Hegelian dialectics’, he says is ‘logically cut of alternatives which history might have permitted’ (71). The claim resonates with Claeys’ own inclinations towards utopianism which he understands as a “better” alternative to Marx’s communism. It is, however, unclear if that is truly the case. An argument to the effect that Marx inherited a ‘categorical inflexibility’ (71) from the dialectic of Hegel asks for a deeper analysis of the notion of logical entailment in Hegel. However, we don’t find the necessary qualification to back this argument in Marx and Marxism. There is the suspicion that Claeys, unsatisfied with the legacy of communism (justifiably so), wants to, come hell or high water, find a point to defend utopianism. But what are, in his mind, the utopian alternatives to Marx’s idea of communism? He argues that Marx’s fixation on Hegel ‘encouraged the suppression of other solutions’ – which we now know is a contentious claim – ‘including mixed forms of ownership and management like those Fourier proposed’ (71). It can be firmly doubted that the Phalanstères communism of the religiously and economically motivated libido-focused anti-Semite Charles Fourier, who found civilization repulsive and thought that trade is the source of all evil and that Jews qua “personification of trade” should be sentenced to perform farm work instead of dealing with money, is in any respect better than the “barracks communism” Marx sought to avoid at all costs. And yet, despite giving a few successful historical examples, Claeys doesn’t try to fully convince the reader of Fourier’s utopia. With regard to Claeys’ take on the role of the intelligentsia, the aversion to philosophical language endeavours him to excavate a universal argument by which it is said that ‘intellectuals use Marx to justify leadership’ by adopting convoluted philosophical terminology which has the ‘seductiveness of incomprehensibility’ (6). For an interpretation of world history that relies so much on language, there is very little material on how and why language actually functions in the way Claeys thinks it does. First of all, why is the obscure and secret language of philosophy seductive? Is there any underlying psychological mechanism which attracts the attention of the people to the obscure? Also, what does Claeys mean by intellectuals here? Claeys clearly demarcates the members of the Frankfurt School, the Existentialists and the “Post-Moderns” as intellectuals, although his comments are rarely benevolent. His talk is about ‘pseudo-proletarian affection’ (404) in terms of the clothing and appearance of middle-class intellectuals, like Foucault. ‘Language and appearance were poles apart’ (404) he says. So, does Claeys propose that philosophical language is inherently bourgeois language? He concedes, talking about the Existentialists, that ‘many of these efforts now seem sterile and dated’ (403). How then does Claeys explain the ongoing interest in and fascination for Sartre, Camus, Bloch and others? The overall impression is that Claeys isn’t drawing a sharp enough line between scholastic (Hegelian) Marxist philosophy and those instances of weapons of intelligibility, such as the propagandistic and formulaic Diamat dogma of Marxism-Leninism. Does Claeys think that Mao, Lenin and Stalin are philosophers? Is their language a philosophical language? Did Marx’s philosophical language foster totalitarianism? Claeys provides no clear answer to these questions. Regardless of these criticisms, Marx and Marxism is a remarkable scholastic work, well-written and studded with interesting historical facts and nexuses which Claeys presents with remarkable scrutiny. Yet, what his thoughts are on Marxism, one can still wonder. He concedes that in 1991 ‘all attempts to rescue Marx from degenerate forms of Marxism (returning to Hegel, criticizing Engels’ materialism or illuminating the discrepancy between Marx and Leninism) had failed’ (450) and that ‘if Marxism represents humanity’s last great secular millenarian attempt to attain paradise on earth, we may well gain more by settling for less’ (452). I don’t agree. What would settling for less mean here? Further, isn’t paradise on earth just another way to describe the utopianism for which Claeys expresses affection? The reader is left with this enigma. Dostoyevsky, in his 1864 novella Notes from the Underground, recommended a utopia-free future in which total harmony and absolute welfare is not the aim. Humans need a little bit of chaos to have a meaningful life, Nietzsche would have added. This does not mean, however, that we should let alienation, inequality and the condition of the precariat go unchallenged. There is already enough chaos in existence. Marxism without utopianism is for what we should be aiming. Claeys as ideologist claims that “Karl Marx was the Jesus Christ of the twentieth century”, but he neither directly explores, or explains or proves this theorem at all. As a historian of ideas, he wants to know “So why, and how, did history nominate Marx for this role?”. Claeys also has a whole grabbag of other questions to explore, such as: “Why was Marx so successful as a thinker? Did he have a ‘system’ and, if so, what does it consist of? Does Marx take us to Lenin? To Stalin? To the revisionist Eduard Bernstein or the ‘renegade’ Karl Kautsky? Is Marx’s theory of alienation still relevant? Was Marx an economic determinist? Did he regard the end of capitalism as inevitable? Is class the most important category of social analysis? Did Marx deny a role to individuals in history? Was he a democrat or a totalitarian?”. The main thesis of Claey’s book is that “The great secret of Marx’s success… lay in his ability to synthesize [his] vision into a few simple formulae which the masses could easily digest, while presenting a complex and all-encompassing world-view which was captivating and intellectually stimulating to the well-educated. No competitor succeeded in achieving this degree of comprehensiveness, or in provoking the extraordinary intellectual ecstasy and moral fervency that Marxism has often induced.” Hrrmph. I doubt that, somehow. The significance of Marx is said to be, that “Of all the great critics of modern society… Marx is the one we most need to confront, to question, to engage with. Both his critique of capitalism and his vision of the future, we will see, speak across the centuries to our times, even if the questions he poses are more difficult to answer than ever, and his answers are sometimes simply wrong.” That sort of statement can mean anything, but anyway, the Red Christ may not be dead, and he could rise again. A lot of the statements and judgements in Claey’s book are logically speaking petitio principii, that is, question-begging statements which assume that which needs to be proved, explained or argued for. For example, he says “McLellan and others rightly see alienation as the chief theme linking Marx’s early and mature writings.” Whether McLellan would agree, I do not know, but in any case it is mistaken. Marx’s whole thought is driven by the revolt against, and criticism of, oppressive conditions than human beings face, and alienation is only one aspect of that. So whereas it is not difficult to read through Claey’s “fait accompli”, fully understanding what’s being asserted and what’s really behind it, is another matter. Academics can of course build careers out of summarizing the work of others, acting as de facto editors while pretending to be writers. It is nice to have control over the meanings of others, and to have the role of an authority who decides the questions which others must answer! One advantage of the summarizing method as a general approach to inquiry is, that summarizing is usually a wonderfully safe sport. When the meaning of your summary is contested, you can always say (1) “it is only a summary”, that (2) “there are obviously more aspects that can be added”, and that (3) “the original sources should be consulted for more information”, (4) “the summary is only intended to communicate a complex topic in the simplest way, to provide an orientation”. You can always add something to your summary, if criticized, to make it plausible again. That way, it is much more difficult to be caught out. Contesting the summary would involve a large amount of effort, to show exactly what its faults are. The more abstract the summary, the easier the “intellectual work” becomes. Taken to an extreme, the summary may only be an apology for not knowing what the subject truly involves. The disadvantages of the summarizing method are (1) that it contains no genuine intellectual originality (the artistry of the summary consists only of selecting and weaving together, various bits and fragments lifted from the literature that might highlight salient aspects of the topic), so that the summarizing writer becomes largely dependent on the ideas of others, rather than his own ideas, that (2) by itself, it gives no proof that the essence of the topic is adequately presented, or that the author really has an integrated, deeper knowledge of the essence of the subject, that (3) in what “appears” as a summary, essential aspects may have been ignored, and others aspects have been added, so that while the summary appears as a neutral, impartial and objective account, it is in fact a highly biased, problematic and selective, and that (4) the summary may miss the point altogether, because it is not the kind of summary that is useful or relevant for the task at hand, out of all the possible summaries that “could” be made of the subject. Ask 20 students to summarize the same literature, and they will all provide different summaries, structured in different ways with different selection criteria. Yet it is not necessarily the case, that particular summaries of some are any better or more valid than those of the others. Beyond the basic “sine qua non’s” of the meaning of the topic, it remains a matter of interpretation, and each interpretation can claim to be based on the literature. The overall effect of the summary is, that we remain more or less exactly where we started – the definition of the subject has been provided, but without any conclusive proof that it is the best definition. There is a description of the subjectmatter, but no more, and it does no compel its acceptance, since it is not the only description among many possible descriptions that can be made of the subjectmatter. “We should dream!” I wrote these words and became alarmed. I imagined myself sitting at a “unity conference” and opposite me were the Rabocheye Dyelo editors and contributors. Comrade Martynov rises and, turning to me, says sternly: “Permit me to ask you, has an autonomous editorial board the right to dream without first soliciting the opinion of the Party committees?” He is followed by Comrade Krichevsky, who (philosophically deepening Comrade Martynov, who long ago rendered Comrade Plekhanov more profound) continues even more sternly: “I go further. I ask, has a Marxist any right at all to dream, knowing that according to Marx, mankind always sets itself the tasks it can solve and that tactics is a process of the growth of Party tasks which grow together with the Party?” The very thought of these stern questions sends a cold shiver down my spine and makes me wish for nothing but a place to hide in. I shall try to hide behind the back of Pisarev.“There are rifts and rifts,” wrote Pisarev of the rift between dreams and reality. “My dream may run ahead of the natural march of events or may fly off at a tangent in a direction in which no natural march of events will ever proceed. In the first case my dream will not cause any harm; it may even support and augment the energy of the working men…. There is nothing in such dreams that would distort or paralyse labour-power. On the contrary, if man were completely deprived of the ability to dream in this way, if he could not from time to time run ahead and mentally conceive, in an entire and completed picture, the product to which his hands are only just beginning to lend shape, then I cannot at all imagine what stimulus there would be to induce man to undertake and complete extensive and strenuous work in the sphere of art, science, and practical endeavour…. The rift between dreams and reality causes no harm, if only the person dreaming believes seriously in his dream, if he attentively observes life, compares his observations with his castles in the air, and if, generally speaking, he works conscientiously for the achievement of his fantasies. If there is some connection between dreams and life then all is well.” Of this kind of dreaming there is unfortunately too little in our movement. And the people most responsible for this are those who boast of their sober views, their “closeness”to the “concrete”, the representatives of legal criticism and of illegal “tailism”. Lenin realized very well, that to build a movement, he needed not only realists, but also idealists and voluntarists striving for something bigger than themselves, and that involved imagining an alternative future, which could be very different and better to the status quo. The belief in this possibility was necessary to motivate people to action.